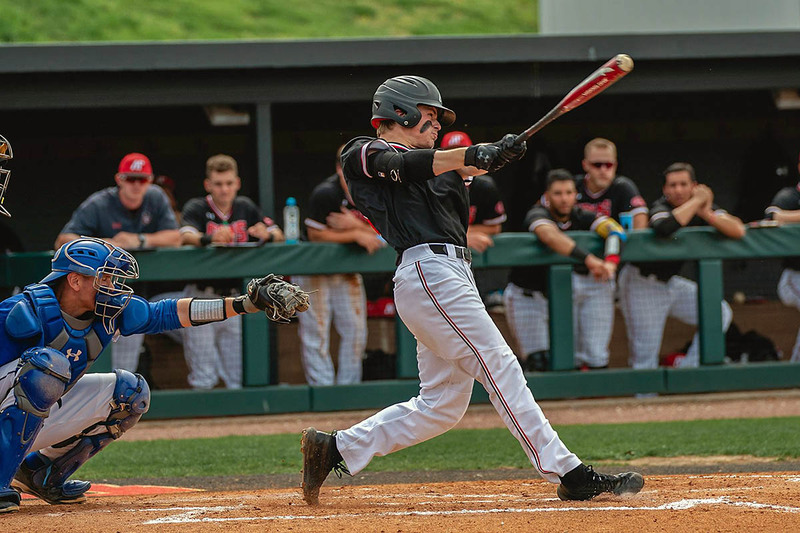 Clarksville, TN – Center fielder Garrett Spain’s three-run home run gave the Austin Peay State University (APSU) baseball team an early lead, but Morehead State scored three runs late to claim a 4-3 Ohio Valley Conference victory, Saturday, on Joe Maynard Field at Raymond C. Hand Park. Trailing 1-0 entering the bottom of the third, Austin Peay (18-16, 11-7 OVC) used back-to-back bunts by left fielder Aaron Campbell and third baseman Gino Avros to apply pressure. Morehead State would get two outs, but Spain made sure Austin Peay would not go away empty-handed. He hammered a 1-0 pitch over the wall in left center despite the falling rain to give the Govs a 3-1 lead. After surrendering a run in the second inning, Austin Peay starting pitcher Brandon Vial would retire 11 consecutive batters to take the 3-1 lead into the sixth when a walk ended his outing. Tyler Thompson entered and retired the first here batters he faced to end the frame. Morehead State (24-13, 9-6 OVC) would open the seventh with a runner in scoring position after first baseman Stephen Hill drove the ball off the wall in center field. Second baseman Ryan Layne would follow with a home run down the right field line, cutting the deficit to 4-3. The Eagles kept the pressure on the Governors bullpen, getting a walk to extend the rally. Reliever Greg Leban entered with that runner on base and one out and promptly induced a pop out for the second out. Leban then appeared to end the frame with a strikeout but left fielder Jake Hammon reached base on a wild pitch to extend the frame again. Morehead State would take advantage of the added opportunity, catcher Hunter Fain’s single to left driving in a run for a 4-3 lead. APSU’s Campbell recovered from a miscue to cut down a runner at home to end the frame. Austin Peay would have an opportunity to tie or regain the lead in its half of the seventh inning. Second baseman Malcolm Tipler led off with a double and shortstop Garrett Kueber earned a two-out walk, but Morehead State reliever Jake Ziegelmeyer got a fly out to end the threat – the first of seven consecutive batters he retired to close out the game and pick up his seventh save. Vial would be left with no decision despite holding Morehead State to one run on two hits and two walks over five innings. Reliever Tucker Weaver (0-1) suffered the loss after allowing two runs in a brief appearance. Spain led the Govs with a 2-for-4, three RBI outing. First baseman Andrew Flaherty also had two hits in the Govs seven-hit outing. Morehead State starter Jason Goe (4-1) surrendered just three runs while scattering seven hits and striking out eight over his 6.1-inning outing. Layne led the Eagles with a 2-for-4, two RBI day at the plate. Austin Peay had little success through two innings against MSU starter Jason Goe, but found some momentum in the third inning thanks to its bunting game. Left fielder Aaron Campbell began the rally with a perfectly-placed bunt down the third base line. Third baseman Gino Avros then pushed a bunt past Goe for another base hit. Two batters later, Spain hit his second home run of the series to give the Govs a 3-1 lead. The Govs freshman continues to prove the stage isn’t too big for him. Spain had nine RBI in the series against Morehead State, going 6-for-13 (.462) with two home runs and a double against a Eagles pitching staff that was ranked second among league teams in ERA. Saturday starting pitcher Brandon Vial put a cap on an impressive weekend by the Govs starting rotation. It began with Jacques Pucheu’s compete-game outing that saw him allow one run. Josh Rye followed with six scoreless frames of his own before Vial held Morehead State to one run over five innings. All told, the trio held the league’s top offense to two runs over 20 innings of work – a miniscule 0.86 ERA. Despite the loss, Austin Peay earned a key series victory against a team also battling atop the OVC standings entering the weekend. The Govs end the weekend tied for third with Belmont, one-half game behind Jacksonville State and Murray State with five conference weekends remaining. APSU Baseball closes its five-game homestand with a 4:00pm, Tuesday, April 16th contest against Southern Illinois at Raymond C. Hand Park.